در این مقاله، مدل ریاضی کاملی برای تحلیل حرارتی بافت کبد در گرمادرمانی سرطان کبد به وسیله لیزر (LITT) ارائه شده است. 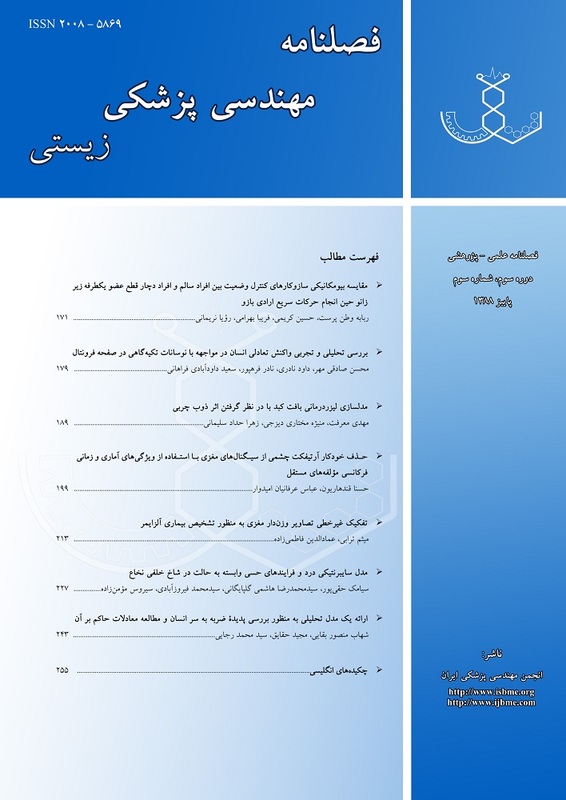 در مدل ارائه شده، برای اولین بار از روش تحلیلی تقریب انتشار به منظور مدلسازی تشعشعی بافت استفاده شده است. مدلسازی انتقال حرارت در بافت زنده با استفاده از مدل پنس و با لحاظ کردن اثر تغییرات ضرایب حرارتی و ضریب تراوش خون با دما انجام شده، همچنین اثر ذوب چربی بر توزیع دما به وسیله روش انتالپی در نظر گرفته شده است. در این محاسبات، بافت تومور به شکل کره ای در میان بافت سالم در نظر گرفته شده است. در نهایت با حل معادلات غیرخطی حاصل با استفاده از روش عددی حجم محدود، توزیع دما در بافت طی گرمادرمانی در زمان های مختلف محاسبه شده است. مقایسه نتایج حاصل با نتایج به دست آمده از طریق آزمایش حاکی از دقت قابل قبول محاسبات است. به علاوه با استفاده از نتایج حاصل، اثر پارامترهای مختلف نظیر مشخصات لیزر و تغییرات ضرایب اپتیکی بر محدوده اثرگذاری لیزر بررسی شده است. نتایج حاصل می تواند راهگشای پزشکان در یافتن یک روند LITT بدون خطر برای از بین بردن بافت سرطانی بدون آسیب رساندن به بافت سالم باشد. In this paper a comprehensive mathematical model for thermal analysis of liver tissue in thermotherapy of liver cancer by laser is presented. In the present model the diffusion approximation analytical method for radiative heat transfer modeling of heat transfer process in the tissue is used for the first time. Heat transfer modeling in the biological tissue is carried out using Penes model taking into account the influence of thermal and blood perfusion coefficient fluctuations due to temperature changes as well as the effect of lipid melting on temperature distribution through enthalpy method is taken into account. In the present study the tumor is considered as a sphere with thermo-physical properties different with those of healthy tissue. Finally, the obtained non-linear equations are solved using the numerical finite volume method. Temperature distribution at several instants during the thermotherapy is calculated. The comparison of the calculated results with those of experimental results indicate a good agreement between the results. Furthermore, the effects of different parameters such as laser specifications and optic coefficient changes (through proper photopherin injection) on laser-affected area are studied using the present analytical method. These results can help the specialists in order to come upon a safe LITT method for destruction of cancerous tissues without harming the healthy ones. Safnat N., Numerical Modeling of Ferromagnetic Embolisation Hyperthermia in the Treatment of Liver Cancer; Graduate School of Bbiomedical Engineering, Uuniversity of New South Wales; A Thesis Submitted in Fulfillment of the Requirement for the Degree of Doctor of Philosophy, 2005. Niemz M. H., Laser-Tissue Interactions, Fundamentals and Applications;Springer-Verlag, 1996. Klose V. and Larse E. W., Light Transport in Biological Tissue Based on the Simplified Spherical Harmonics Equations; Journal of Computational Physics, 2006; 220: 441-470. Cheng, P. & Chi Lui, K., Numerical Analysis of Bio- Heat Transfer in Spherical Tissue; Journal of Applied Sciences, 2009; 42: 1638-1644. Abraham J. P. and Sparrow E. M., A Thermal-Ablation Model Including Liquid-to-Vapor Phase Change, Pressure-and Necrosis-Dependent Perfusion, and Moisture Dependent Properties; International Journal of Heat & Mass Transfer, 2007; 50: 2537-2544. Brusche, J.H., Segal A., Vuik C., An Efficient Numerical Method for Solid-Liquid Transitions in Optical Rewritable Recording; International Journal for Numerical Method in Engineering, 2009; 77: 702-718. Siegel R. and Howell J., Thermal radiation heat transfer, 4th edition; Taylor & Francis, Washington; 2002: 663-703. Theis E., The Lipid Distribution in Normal and Abnormal Liver Tissue; Journal of Biological Chemistry, 2008; 127: 107-114. Valvano J.W., Bioheat Transfer; Biomedical Engineering Program, Department of Electrical and Computer Emgineering, The University of Texas at Austin; Thesis Submitted for the Degree of Doctor of Philosophy, 1990. Dock F. A., Physical Properies of Tissue; Academic Publisher, London, 1990. Mokhtari M., Gorjiara T. and Chanaati H., Assessment of Pixel Shift in Ultrasound Images due to Local Temperature Changes During the LITT of Liver in Vitro Study; Ultrasound in Med. & Bio, Tehran, Iran, 2006; 33.